When experts first proposed the patient-centered medical home, they didn't expect physicians to start converting their offices into homes. But making waiting rooms more like living rooms is one way to increase patient satisfaction and reduce frustration with delays, according to speakers at the Medical Group Management Association's annual meeting, held last fall in San Diego. Patients' perceptions of waiting are key to their satisfaction, and therefore return and referral business, said Robert Wolosin, PhD, research project manager for Press Ganey Associates, a vendor of patient satisfaction measurement services. The bad news is that the average patient is not willing to wait very long. “About 10 minutes is kind of the breakpoint. If you're waiting longer than 10 minutes, you're getting very unhappy,” he said. Fortunately, it's relatively easy to change people's perception of their wait. According to Press Ganey survey results, a waiting room judged to be a comfortable and pleasant atmosphere had a dramatically positive effect on satisfaction scores. “You can recoup almost all of the satisfaction that you lose by waiting,” Dr. Wolosin said. Matt Turner has been putting these principles into practice, as assistant vice president for leadership and organizational development for Carolinas Physicians Network. The goal is to make coming to their practices feel more like visiting Starbucks, where people will pay $8 for coffee and a doughnut, than Dunkin Donuts, where the same product is $2, he explained. As cheap, simple changes, the Carolina practices bought lamps to provide some low-level, homey lighting. They rearranged the furniture into smaller groups to create a more comfortable, conversational area for older patients and their caregivers. They also branched out from the waiting-room activity staple of magazines and added jigsaw puzzles. 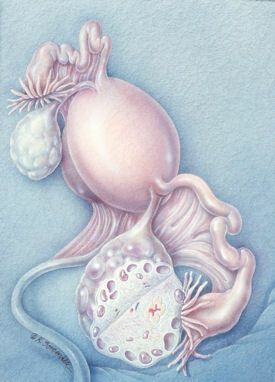 “This has been a big hit, especially with our big internal medicine practice. People will start it and they'll get called back to go to their visit and they'll say, ‘But I've almost got …’” Mr. Turner said. “There are lots of these kinds of things that cost practically nothing,” said Mr. Turner. 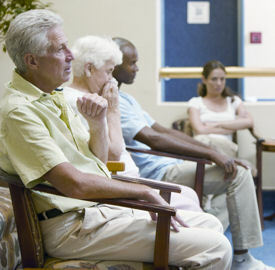 Another inexpensive way to improve patients' waiting experience is to change your staff's approach, the experts advised. At Emory Healthcare in Atlanta, a campaign urged staff to notify patients about how long they would be waiting, said Redge Hanna, director of service performance. “If patients wait, they deserve an update,” was the campaign slogan. Just giving patients information about how long the wait would be reduced complaints, Mr. Hanna said. Nurses can also make the waiting room more hospitable by walking over to patients when it's their turn to come back rather than shouting from the doorway. “Take the extra steps to walk over. That's a subtle, simple thing that makes it feel like home,” said Mr. Turner. Once you've started on construction projects, the potential improvements are legion, from replacing institutional wallpaper to creating multiple small waiting rooms with individual TVs, wireless access and massage chairs. But it's not necessary to spend much money to make a difference, Mr. Turner said. He highly recommended “The Walk,” a weekly exercise in which one employee goes through the practice, observing everything that patients see—from trash in the parking lot to signs taped on exam room walls—and notes anything that could be improved.